First things first. This was NOT my fault. Not even my department. Nothing to do with me. And the rumour that the guy responsible showed up dead in his hotel room the next day? Complete rubbish. Moving right along... Hi! I know it's been a while, but I did warn you. Here's a bit of catch-up: I finished work in Russia on March 21, spent a quick weekend in Moscow with the lovely Moscow hashers, had a short stopover in a London to do laundry and re-pack, and then was off for a week of vacation in New York City, followed by two weeks of visiting with family in Canada. I finally got back to London and unpacked my suitcase for what I hope will be a long long time just a week ago. So the job ended about a month ago, and yet it seems like a hundred years. For those of you who haven't been paying attention, I was living in Russia and working on the Opening and Closing Ceremonies for the Sochi 2014 Winter Olympics and Paralympics. All of it feels impossibly, deliciously distant in a way that I wouldn't have believed when I was in the middle of it. I arrived in Moscow at the beginning of August 2013 and I left at the end of March. Eight months, including a punishing stretch of more than five months without a trip out of the country. 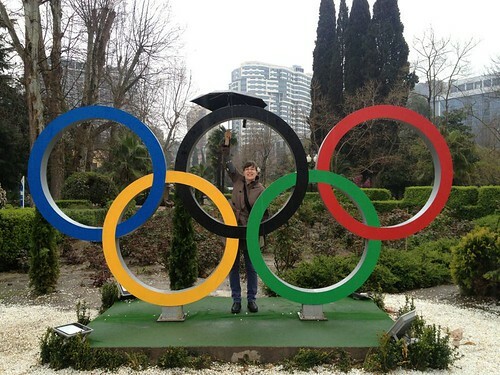 Me posing with some rings in Sochi. I'm smiling because this was taken on the day before I left! This will be stating the blindingly obvious, but did I mention I was in RUSSIA? 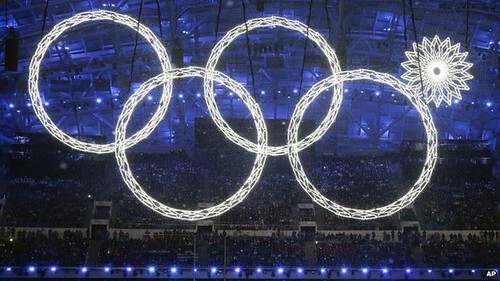 With the London ceremonies, even when it was crazy, I was still going home every night. That was a huge comfort. I slept in a familiar bed. I cooked and ate normal food. And on the rare occasions when had a day off, I had friends to visit and a normal life that I could dip back into, even if only briefly. In Russia I lived for the whole time in various hotels ranging from gorgeously well-serviced (Moscow) to eminently pleasant (Krasnodar) to three star orange-wallpapered, saggy-furnitured shoebox (Sochi). The orange shoebox. It was quite a come-down from Krasnodar and Moscow, though I did eventually make my peace with it. Not that I had a choice. Also, in London there were people in my life who had nothing to to with ceremonies. I saw them occasionally when I dragged myself in from a long night and they were up finishing the end of a bottle of wine and I was reminded that normal life continued for some people. In Russia I got on the staff bus in the morning with the same people I'd work alongside all day. We ate lunch together. We ate supper together. We moaned and complained together. We waited for the bus home together. And then when we got home to the same hotel, the only people to have a drink and unwind with were the same people you'd just spent the whole day with. Luckily, there were many excellent people and I formed some really great friendships. But still, it was relentless and unnatural. 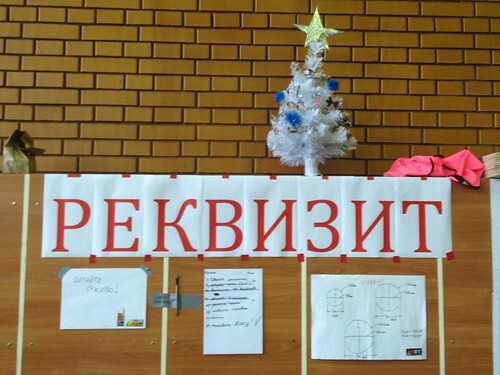 Once again in the blindingly obvious category, most people in Russia speak Russian. There was a large contingent of international English speaking consultants (me included... we were all there in what was technically called an advisory role...), and an equally large number of local Russian people, some of whom were bilingual and some who were not. The Props Team in particular seemed quite integrated. Our international and local Russian staff worked alongside each other every day, which happened less in departments that had mostly international staff and contractors. And of course outside the office on the street, it was all Russian all the time. "Wait a minute," you astute GSWPL readers might say. "Didn't you take a few month of intensive one-on-one Russian language lessons before you went? I'm sure I remember a whining blog post about that…" Of course you're right. I was one of a handful of international staff who had made an effort to take formal lessons (I think there were four of us) and it definitely made a difference. By the end of my eight months I could make myself understood most of the time with out uni-lingual Russian crew, though I was largely limited to bread-and-butter stuff like, "After rehearsal we need all props in Tent B." Or "This is very very important." Or frequently "I'm tied, hungry and cold." Not bad, eh? Unfortunately, as is the case with my French, I speak Russian much better than I understand it. So while I can phrase a comprehensible question, parsing the answer was often beyond me. Nonetheless, it made a difference. For instance, the Transport department had English and Russian staff, but it was the Russians who really held the reins. So whenever I needed a truck for one of the endless back-and-forth moves of props from the stadium to the rehearsal venues and back (honestly, it was like we were doing laps with them) I had to speak to Transport. Eventually the English Transport Manager just said, "Look, you just need to go across the hall and talk to Albina, because that's all I'm going to do anyway. She doesn't speak English, but someone will translate for you." So across the hall I went and started to make my request in English, but when I understood some of the related Russian conversation and responded in Russian... well! The transformation was miraculous. Suddenly it was all, "You speak Russian! Sit down! Where did you learn Russian? What do you need again?" I felt a bit like a dog walking on its hind legs, but on the other hand I never had trouble getting a truck again. So there you go. Like anywhere, if you make a little honest effort, people respond. 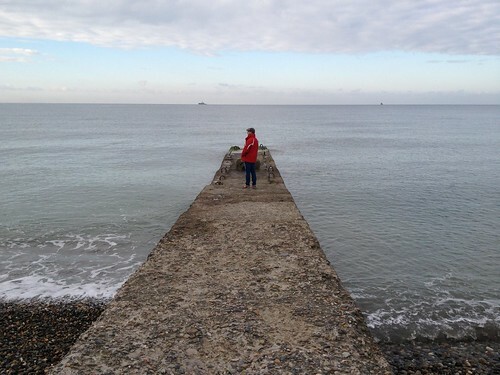 The beach, on New Year's Day. Anyways, the supermarkets were not great in Adler. And of course you might notice from the picture of my hotel room that I did not have a kitchen. I anticipated this fact before arriving and actually bought a portable toaster oven sort of thing that I schlepped from London to Moscow to Krasnodar and finally to Sochi. And what did I find out when I got there? The hotel had banned all such devices. Of course. 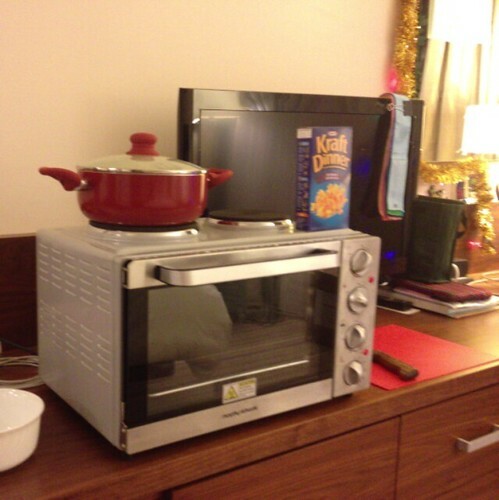 Here’s the device in action briefly in Krasnodar, cooking up a pot of Kraft Dinner on one of the two top elements. It was a great appliance. We never got a really clear reason WHY this was the case. Sometimes they cited fire regulations. Sometimes they claimed there wasn’t enough power. Sometimes they said that you could use a device if it had an automatic shut-off timer, like a kettle or a toaster. My next-door neighbour and partner-in-crime Gerald (pictured above, posing on the pier on New Year's Day) cleverly bought a multi-cooker that was like a quick crockpot sort of thing. It seemed to tick all the boxes and we enjoyed one really nice meal out of it before it, too, was banned. Add to this less-than-ideal hotel situation a total prohibition on bringing food or drink into the Olympic Park. Total. Every day we had to line up at the security gates for an airport-style x-ray and pat-down. Every day people had food confiscated. Some people even had packs of gum or breath mints taken away. And sometimes this was after we’d stood in line for 45 minutes just to get to the point where they’d take your stuff. It was really dehumanising. Most people developed systems for smuggling in small amounts of food (mine involved balling things up in a particularly thick pair of sock. "What? Food? Nope. No food here Mr. Russian Policeman. Just some warm socks for later. Yep. Nothin' to see here...") Even though I was one hundred percent successful in my smuggling efforts, it generally wasn’t enough to keep body and soul together which meant that at least once a day you’d have to take your chances on the staff canteen. The canteen was... Overcrowded. Overpriced. Overcooked. Just really disheartening. The fixed price was 300 roubles (About £6 or $9). For that you got a salad course, usually a choice of something heavy on the mayonnaise and potato, or a plate of scary sliced luncheon meat, or a bowl in which beets featured prominently. Then soup (though only at lunch), which was usually thin and highly average. Borsht. Solyanka. 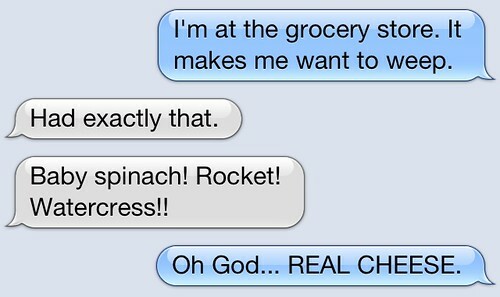 Creamed vegetable. Meh. The main course was usually the worst. A few kinds of potato or rice, or sometimes a boiled vegetable. Plus a choice of some kind of dodgy meat product, often a sort of processed cutlet, or maybe fish, or maybe chicken. It was all just maddening and nasty a lot of the time. 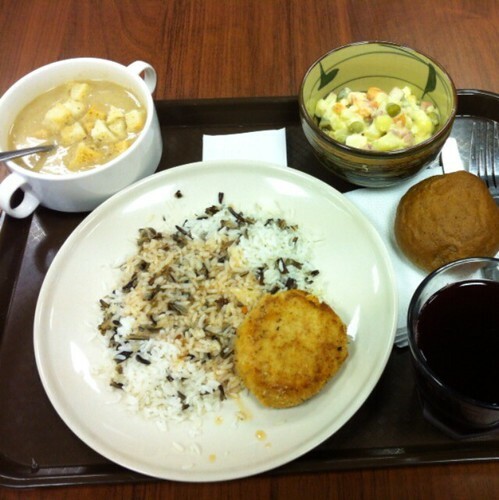 Clockwise, from top left: cream-of-something soup, pototo-mayonnaisey salad, bread roll, glass of compote (a juice-like beverage) and a plate of rice with random sauce accompanied by processed meat cutlet of some kind. Typical. You wouldn't go hungry, but then again, you might just end up with scurvy. In fairness, they did improve things after a few near-riots caused by crushingly long line-ups and inflexible opening hours. Eventually you could get fresh fruit and yogurt and take-away pizza and real coffee. But they never relaxed the food ban and it was always an issue. I don't know why, but Russian cheese is kinda awful. So yeah, I think that's enough for now. Enough to start giving you an idea of life in the Ceremonies Salt Mine that was Sochi 2014. And enough to get me back on the blogging train. I might just skip ahead and tell you about my trip to New York next, or I might tell you some more random tales of Russia, but either way I'll try to do it soon.